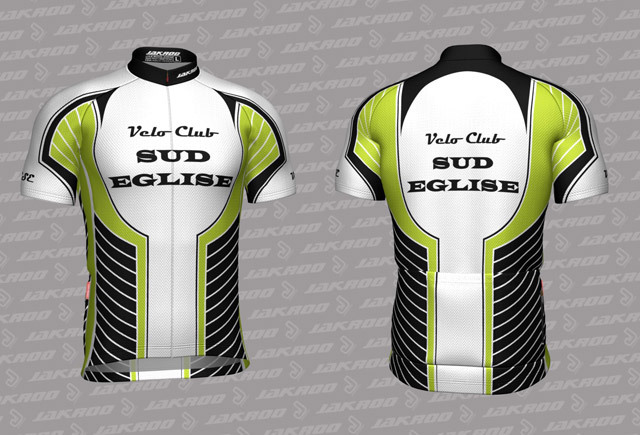 If you have visited Velo Club Sud Eglise and read the ‘About’ page you will have noticed that the blog was spawned by the original idea of selling (cycling related) t shirts (mainly) and anything else I could think of sticking a logo onto. Cut a long story short; our merchandise partner went bust and so did (most) of the designs as the tools used to create them belonged to the partner and thus the intellectual property rights went with them too. The writing side of things has taken over in the last year or so but the plan had always been to start doing VCSE stuff again when I could find the time and the right partners to work with. When we had the t shirt store people often asked why we didn’t have any cycling specific clothing on offer. At the time there wasn’t anyone out there that I thought had the design ‘chops’ to come up with something that I would want to, a) see the VCSE logo on and b) wear on the bike (most important!). In the last few months I have seen a few examples of Jakroo jerseys and after checking them out we asked them to design a jersey for us. While the design itself is not 100% custom I think the colours we’ve chosen have a really classic look and the design is a bit of an homage to the HTC Columbia jersey. There’s a link to the webstore here: http://shop.jakroo.com/VCSE-Design-1 and the actual jersey is pictured below. At the moment there’s just the one design but we should be getting bibs and a winter jacket added shortly. We will be able to get a better price based on quantity, so while you can order individual items from the page it will probably be cheaper to email me if you’re interested and I can do a bulk order. Prices are in US$ and exclude VAT so take that into account when you’re looking at prices. There’s a saving of $40 just by ordering two jerseys so I really do recommend getting in touch if you want one as I can get the best price available then. Look out for the extended range that should (hopefully) appear early next year and I will add details on here as we add more lines to the range and maybe even start doing the tees again!